NCHA represents North Carolina’s individual and multi-hospital health systems — teaching, rural, small community, suburban, specialty, and continuing care facilities — providing acute care, rehabilitative, behavioral, psychiatric and veterans’ services. Our members provide a broad range of services — not just within their walls, but across the continuum and throughout their communities. NCHA has always been a member-led organization, with five executive leaders during its history. Hear what our members and partners have to say about our name change to the North Carolina Healthcare Association: Uniting Hospitals, Health Systems and Care Providers for Healthier Communities. To learn more about the Strategic Plan, please log in. See NCHA’s Historical Timeline to learn more about the Association’s first 100 years. On June 2, 1918, in Greensboro, Dr. J.F. Highsmith of Fayetteville proposed that the N.C. Committee on Hospital Standardization, made up of three physicians and three registered nurses, become the North Carolina Hospital Association. 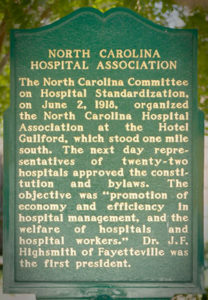 The next day, a constitution and bylaws were proposed stating that the objective of the association “shall be the promotion of economy and efficiency in hospital management and the welfare of hospitals and hospital workers in North Carolina.” Active membership required payment of an initiation fee of $3, plus annual dues of $5 per person. The first year, membership included 26 physicians and nurses. Dr. Highsmith served as the first President of the Association, reflective of the fact that most early hospitals in the state were organized by physicians. Today, NCHA includes a membership of more than 130 hospitals and health systems providing acute care, rehabilitative, behavioral, psychiatric and veterans’ services. In addition, many member health systems include wellness programs, primary care, urgent care, and freestanding emergency care. Industry consolidation has fundamentally reshaped the landscape of healthcare delivery in our state. As NCHA approached its Centennial year of service to its member hospitals, health systems and care providers, the NCHA Board of Trustees embarked on a process to evaluate the reputation of the association’s brand and chart a course for the future. Their visionary leadership has led to a new name and a new brand for the organization that not only respects our strong history, but is more inclusive and representative of the current and future membership. To improve the health of the communities where we live and work by advocating for sound public policy and collaborative partnerships. The NCHA vision is of the highest possible level of quality healthcare delivery throughout North Carolina. Integrity: Every NCHA act, individual or corporate, is conducted ethically and honestly. Acknowledging its diverse membership, the rapidly changing healthcare environment, and competitive demands of the market place, NCHA facilitates open debate and deliberations and transacts all discussions and actions in an open, ethical, and balanced fashion. Excellence: NCHA strives for excellence in all things, in all ways. Through a commitment to continuous quality improvement, NCHA provides enhanced programs, services and initiatives. Leadership: NCHA leads toward the future through commitment to a healthy North Carolina. NCHA’s leadership is directed toward making North Carolina hospitals the safest in the nation. NCHA facilitates collaboration among healthcare providers and related associations, organizations and agencies aimed at improving the quality of healthcare.